I am so thankful to Baby Hopeful for their feature on Ever Upward. If you just can't wait for the October 1st release date, you can read the first 1000 words of Chapter 1~Conceiving Our Chosen Family here! Don't forget to pre-order your book today! And, don't forget to register for the book signing and launch party! So far the reviews are amazing, make sure to check them out and spread the word! Having trouble describing Ever Upward to others? 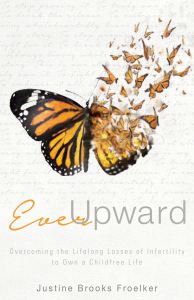 Ever Upward is a book of stories, my story, about what to do with your life when it just didn't turn out how you had hoped; it is about letting go of what isn't in order to find and embrace our ever upward. To the 1 in 8 couples who endure infertility treatments, common questions like these do not feel at all innocent or well-meaning. Instead, they can feel invalidating to the brutal battle of infertility and minimizing to the often arduous path of adoption. Ever Upward is the story of how Justine Brooks Froelker redefined her life for the better after the heartbreaking, devastating and lifelong losses of infertility. Beginning with Justine’s incredible story of surviving two back surgeries, a year in a body cast and IVF with a gestational surrogate, Justine guides the reader through the strategies she used to overcome the loss of her dream of motherhood and chose to thrive through the ownership and acceptance of her childfree, yet childfull life. Providing a voice to those silenced by infertility, Ever Upward gives permission to talk about it, embrace it and own it all. Opening the conversation to ask for understanding and acceptance of the path that sadly doesn’t include children, it challenge us all to consider more than one happy ending. Ever Upward is Justine’s story, and yet it is our story, parent or not, because behind the wall of shamed silence, the smile and “I can do everything” attitude lies millions of couples suffering with the pain of infertility. Join Justine as she shows us that the connection to our stories in the only way back to the truth of who we are.